Welcome to Spider Farmer Dimmable Series LED Grow Light, with full spectrum layout, reflector design and upgraded aluminum cooling heat sinks, is ideal for all kinds of indoor plants veg and flower at all growth stages. Spider Farmer Spectrum has been developed by indoor growers over many years of careful experimentation and testing. With this light, you will see an increase in quality by growing bigger flowers that are dense and completely coated in resin. Spider Farmer Dimmable Series are scientifically engineered to keep the balance with high PAR/Lumen and suitable Coverage. This design will not far too concentrated in the middle of the growing area which results in stunted plant growth and sunburning. With revolutionary aluminum cooling heat sinks and high speed quite cooling fans, run 70% cooler than (HID) lights. All lights of the series all have IR, growth &bloom Dimmers. Spectrum: White, 450475nm, 620630nm, 650670nm, IR. Color of Outer Casing: Royal Black. Product Dimensions: 12.67.92.8inches(32020076mm). Decibel of the light: Around 56 DB. Net Weight: 2.5KG(5.51lbs). View Angle of LEDs: 90/120 Degree Mixed. Heat Sink Size: 5.044.610.39inches2PCS. Normal Coverage (At Height 18'') : 3.52.5ft. Bloom Coverage (At Height 18'') : 32ft. Professional spectrum design for high yield. Can change the intensity of full spectrum as you wantNo need to change the height! 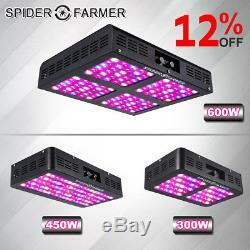 1 X Spider Farmer Dimmable 300W LED grow light. 1 X 6.5ft Power cord. Extremely bright, do not look directly at the LED bulbs when the light is working. Indoor use only, not water-proof. Do not need any ballast. Can be controlled by Timer. Par Value: 540.1 umol. Product Dimensions: 15.78.32.8inches(40021076mm). Net Weight: 3.1KG(6.83lbs). Heat Sink Size: 14.202.760.39inches1PCS. Normal Coverage (At Height 18'') : 42.5ft. Bloom Coverage (At Height 18'') : 3.52ft. Can change the intensity of full spectrum as you want(No need to change the height). 1 X Spider Farmer Dimmable 450W LED grow light. Product Dimensions: 15.012.62.8inches(38032076mm). Net Weight: 4.6KG(10.14lbs). Normal Coverage (At Height 18'') : 3.53.5ft. Bloom Coverage (At Height 18'') : 33ft. 1 X Spider Farmer Dimmable 600W LED grow light. Only used indoor, not water-proof. Don't stare at the light directly when it works, it's harmful to your eyes. The true power of real 5w epistar led is at least the 2w! So called double 5w epistar led, just drive 1 watt! You may also want to know. If you don't need it, please inform us within 7 days too. (Man-made damage will not be acceptable). Don't forget that good communication can solve all problems. We ONLY accept the return for original package. Please make sure that item has NO man-made sabotage. Used items will not be accepted for return. If you need to return, please check twice to confirm the item not work and contact our customer service representative, let us know the detailed problem and send us some pictures for confirmation. All our lights passed CE, UL, ROHS certificate, our Power supply, Fans and wire all are Fire-resistant material, won't catch fire. We are always trying our best to offer our buyers good products with a cheap price, thank you for choosing our products. We beg for your forgiveness if you do not receive our reply in time. Please resend your message and we will reply to you as soon as possible, thanks. We will try our best to provide you with the best service and assistance. The item "Spider Farmer Dimmable 300W 450W 600W LED grow light Full spectrum Veg Bloom IR" is in sale since Friday, September 08, 2017. This item is in the category "Garden & Patio\Hydroponics & Seed Starting\Grow Light Kits". The seller is "hydroponicseller-uk" and is located in Germany.